Biasiswa Tunku Abdul Rahman scholarship is named after Almarhum Y.T.M. Tunku Abdul Rahman Putra Al-Haj who was the Father of Independence (Bapa Kemerdekaan) or Father of Malaysia (Bapa Malaysia) and also the first prime minister of Malaysia. This prestigious and exclusive scholarship is offered to bright students who have strong leadership quality to continue their studies at the bachelor's degree level at higher education institutions in Malaysia. 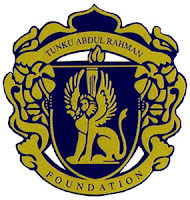 The receivers of this scholarships are called Tunku Scholars. *Award of scholarship is based on applicant's acceptance to local higher education institutions. Receivers of Biasiswa Tunku Abdul Rahman scholarships are required to work for the country for minimum 5 years after completion of sponsored education. Get the BIASISWA TUNKU ABDUL RAHMAN (BTAR) application form online at YAYASAN TUNKU ABDUL RAHMAN foundation website www.yayasantar.org.my. Applications for undergraduates currently pursuing bachelor's degree must be submitted through TIMBALAN NAIB CANSELOR (HAL EHWAL PELAJAR). *Only shortlisted candidates will be called for interview. Applications are considered fail if candidates are not contacted after 3 months.